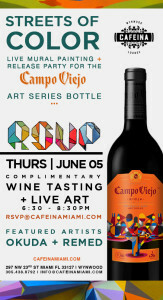 On Thursday, June 5, Cafeina Wynwood Lounge will host an intimate wine tasting of the Campo Viejo range from 6:00 to 8:30 p.m., led by winemaker Roberto Vicente to launch their limited edition Reserva Art series bottle. Urban artists Remed and Okuda, designers of the bottle’s artwork, will be painting a mural that references the vibrancy and expressiveness of Campo Viejo wine, Rioja and Spanish culture. The mural will be unveiled following the wine tasting, and will be celebrated with an evening reception at Cafeina; RSVP@cafeinamiami.com. Gaby Duran’s powerful voice will fill the Living Room at W South Beach on Thursday, June 5 from 7:00 to 9:00 p.m. As guests mix and mingle to Duran’s musical styling, the talented mixologists at Living Room Bar will be crafting the signature artisanal libation for the evening. Snacks from Living Room’s exclusive menu crafted by Conor Hanlon, executive chef of Andrew Carmellini’s award-winning American restaurant at W South Beach, The Dutch, will also be available. 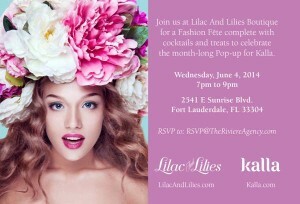 Kalla, a one-of-a-kind, luxuriously curated bouquet service, is celebrating its Fort Lauderdale launch with a custom, month-long pop- up experience at Lilac and Lilies Boutique starting Wednesday, June 4. Just in time for Just in time for summer, Kalla’s innovative online boutique, which has set out to revolutionize the flower industry, will spring to life; curious shoppers can enjoy the multi-sensory Kalla experience. A modern day flower cart will showcase Kalla’s floral couture collection of bold blooms bursting with fragrant, floral notes and styled in limited edition vases of hounds tooth, polka dot and chevron patterns; For more information visit: www.lilacandlilies.com. 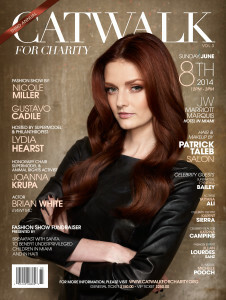 Catwalk for Charity the annual fundraising event will take place on Sunday, June 8 at the JW Marriott Marquis Hotel in Miami at 12:00 p.m. The event will benefit Breakfast with Santa, supporting underprivileged children in Miami’s Little Haiti and neighboring cities, as well as various towns in Haiti. Joanna Krupa, supermodel will be the honorary chair and will be honored for her Nationwide Philanthropy along with other celebrities supporting the cause. Actor Brian J. White will serve as the Master of Ceremony for the third year in row. General admission tickets start at $150 and include the champagne brunch, fashion show, gift bag and silent auction access, featuring art, fashion and exclusive getaways. A runway front row seat is available for $250 and is all-inclusive, with attendance at the Celebrity VIP Reception; For more information, visit www.catwalkforcharity.org and www.breakfastwithsanta.org. On Friday, June 6 at 7:00 p.m., The Leukemia & Lymphoma Society hosts an evening of recognition and celebration at its annual Miami Man & Woman of the Year event, a 10-week national campaign, hosted by the Southern Florida chapter to raise funds to help find cures for blood cancers at the InterContinental Miami. The candidates who raise the most funds will be awarded the title Man and Woman of the Year. Candidates run in honor of the Boy and Girl of the Year, who are local blood cancer patient survivors and sources of inspiration for all. To donate or to purchase tickets visit one of our local candidates running to help this wonderful cause, Zachary Scott; his is link:http://www.mwoy.org/pages/sfl/mia14/zscott. 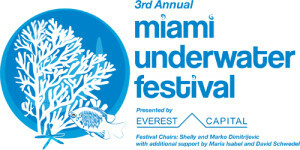 Patricia and Phillip Frost Museum of Science (formerly Miami Science Museum) is inviting the public to “dive into” its 3rd Annual Miami Underwater Festival on Saturday, June 7 and Sunday, June 8. The festival is being held in celebration of the global World Oceans Day, which honors the body of water which links us all, for what it provides humans and what it represents. This will be the first time guests will be able to access Knight Plaza, and have many opportunities to see/takes photos of the progress of the new museum. On this day, all events are free (parking fees may apply.) For more information, visit www.miamisci.org. Amigos For Kids, a nonprofit organization dedicated to preventing child abuse and neglect, will host the 2014 Voya Miami Celebrity Domino Night on Saturday, June 14, at 8:00 p.m. at Jungle Island. Recognized as one of Miami’s most highly anticipated fundraisers, Amigos For Kids is fortunate to partner with its major corporate sponsors Voya Financial, Bacardí U.S.A. and Lincoln Motor Company for the 2014 Voya Miami Celebrity Domino Night.Domino Night 2014 will feature the renowned celebrity orange carpet, celeb domino players, bar courtesy of presenting sponsor, Bacardí U.S.A., a silent auction, live entertainment, South Florida culinary fare and much more. This year’s Celebrity Hosts include Alicia Machado, ex-Miss Universe and Deco Drive’s Louis Aguirre, a longtime supporter of Amigos For Kids, as well as local news anchors Alina Mayo Azze and Jackie Nespral. Tickets to the 2014 Voya Miami Celebrity Domino Night are $150/person in advance, $175/person at the door, and reserved domino tables of four are available for $1,000 each, with all proceeds benefitting Amigos For Kids; For more information regarding tickets and reservations, contact Amigos for Kids at 305. 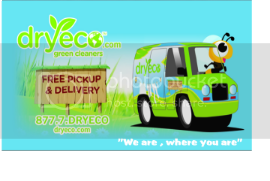 279.1155, or visit at www.amigosforkids.org. Mulligan’s Beach House Bar & Grill has announced it will be donating money to Angel’s Pediatric Heart House through two fundraisers this summer. Angel’s Pediatric Heart House, a local nonprofit, provides South Florida children with Congenital Heart Defects (CHD) and Childhood Acquired Heart Disease with emergency financial assistance and raises CHD awareness in the community. As part of a 12-week fundraising series, two dates with festive themes were chosen for Angel’s Pediatric Heart House to receive a portion of the evenings’ total proceeds. The party theme on Thursday, June 5 will be “Fiesta,” and Thursday, July 10 will be “Under the Sea.” Both adults and children are encouraged to come dressed up in costumes inspired by the themes; for more information visit: mulligansbeachhouse.com.